With Summer on the horizon, and my tomato plants in the ground, I am dreaming of those future BLT sandwiches we will be making from our homegrown tomatoes. 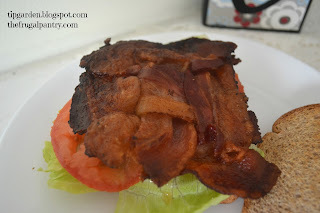 I wanted to share my favorite tip for cooking bacon for sandwiches or burgers. It uses the same 3 slices you might ordinarily put on your sandwich/burger, but gives you bacon in every single bite! Once you've tried it, you wont' go back to just putting bacon strips on your sandwich ever again! The trick is to weave the bacon slices into a waffle pattern prior to cooking it. Preheat oven to 435 degree's or you can microwave the bacon if you prefer. Take 3 slices of bacon (I prefer the thick sliced) and cut them in half, to make 6 half slices. with the 4th, 5th and 6th slices weave them horizontally over and under the 1st, 2nd, and 3rd slices, alternating the next slice so that it's opposite of the one before as shown below. You should now have a "woven" square of bacon. Bake in oven 10-15 minutes, flipping the bacon over half way through till crispy, or microwave till crispy. (times will vary depending on micrwave). Ready for that perfect sandwich!